With a high of 93° today, I think it's safe to say it's officially salad season. This marks the time of year that salads are frequently my first choice, and I can tell you without a doubt they're even more likely to be my first choice when there's a fried egg involved. When we were asked to come up with a salad involving cheese for Président's Art of Cheese launch, there seemed to be endless possibilities. Feta is a really versatile option to begin with for dressing up greens, which made us extra intrigued by the Valbreso Feta. The sheep milks adds a different flavor than a traditional feta, it's definitely got some tang to it. We wanted to use a cheese that was creamy but would still crumble easily in a salad, and that's exactly what the valbreso is great for. We've been extra hooked on tartines since we got back from Paris. It’s such a good way to showcase something fresh like a salad. We worked in layers when we were planning this meal, starting with the dressing. Making a tarragon vinaigrette was a done deal from the start. Fresh herbs and vinegar are a nice complement for the richness of the cheese, arugula for the spiciness, crunchy bread underneath, a strong feta, and our last addition, bacon. We then realized we had inadvertently made a fancy version of bacon and eggs in salad form, and I am totally okay with that. We served fresh fruit with classic feta on the side to balance savoriness of the tartine. Tartine's lend themselves to being hearty, as they're piled high with delicious toppings and this one is no different. Be generous when layering on the greens and don't worry about the unavoidable mess that will ensue once you start eating. Art of Cheese is a showcase of the newest products coming from Président Cheese. They are currently holding a pinterest sweepstakes where you can win $50 worth of their cheese products. You can visit ArtOfCheese.com if you're interested, where you'll also find coupons available for download, and more product information. *Sponsored post note: I was compensated for this post by Lactalis Deli, Inc., and provided with complimentary Président cheese products for the recipe. All ideas expressed are my own. Toast sourdough bread until slightly browned and crispy. In a small bowl, toss arugula with tarragon vinaigrette until coated. Top sourdough bread with arugula, and sprinkle with bacon and Valbreso cheese. Heat a small nonstick skillet over medium heat. Cook egg until whites are set and edges begin to curl. At this point the yolk will still be slightly runny. 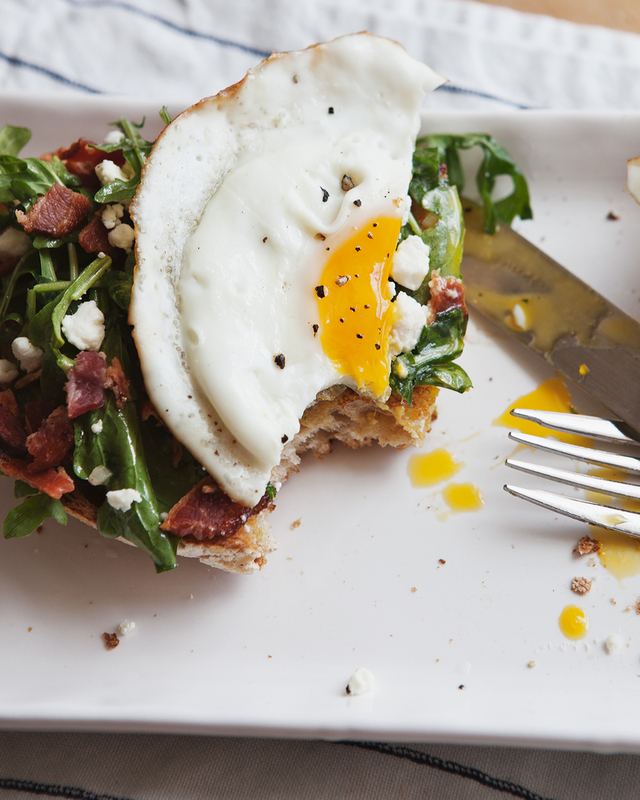 Place egg atop tartine and serve warm. In a small non reactive bowl, whisk to combine vinegar, mustard, shallot, tarragon, and a generous seasoning of salt and pepper. Slowly pour in olive oil and whisk to emulsify.